After nearly five years of war in Syria, Lebanon (a very small country next to Syria) has more refugees than anywhere else in the world. The government in Lebanon does not want this to continue as they don’t have enough resources. But some Palestinians who live there are helping: Christians helping Muslims. Reem Haddad reports. Something strange and new is happening 12 kilometres north of Beirut. Women in veils with children are walking around the little Christian town. The radio plays parts of the Qu’ran sometimes. This is strange for the Christian residents. They usually only hear their Sunday church bells. Women in veils are not new for Lebanon. There are more Muslims in Lebanon than Christians. But they usually live in separate areas. And so it was a shock at first for the Christians in the little Dbayeh camp to have Syrian refugees, many Muslim. At first there were some arguments. But after the shock, they started to welcome the refugees. The 500 residents of Dbayeh understand the refugees because they and their families have not had homes for more than fifty years. In 1948 they had to leave their homes after the creation of Israel. Catholics from around Galilee (N. Palestine) were called refugees. The Lebanese government did not give them many rights. Even today, a Palestinian cannot be the owner of a house and cannot work in more than 70 skilled jobs. They are not welcome and many people hate them. Dbayeh camp is poor. Then 50 refugee families arrived in the camp. Palestinians could understand the Syrians. But they were not happy because the new families took local unskilled jobs for less money. Soon, clothes and food started to come for the Syrians. But there was a big problem: no education. Syrian children could only get places in the local schools if there was space after all the Lebanese students registered. So many refugees had no schools. There were many Syrian children in the camp with nothing to do. So the JCC made their small building into a school house with five rooms. The new government rules make it very difficult for Ballout. She has to pay every year for new residency permits. This can cost $1,000 for a family. Her story is the same as many other Syrian women. Her husband was working as an unskilled labourer in Lebanon before the war. Ballout and their children joined him when the fighting started in their town two years ago. She now lives in a three-bedroom flat with three other Syrian families. But every morning, Ballout’s children go to the JCC school. There are 91 children at the school, and four teachers – three Syrian and one Palestinian. Parents pay $6 per month and all materials are free. In the afternoon, the classroom becomes a community centre for the camp’s children. They have singing, stories, dancing and, in summer, camps and trips. ‘The Palestinians have been wonderful,’ said Rania Merjeh. Her house in Aleppo was completely destroyed. She came with 30 other women to the JCC centre for a meeting with Habib about their children’s progress. 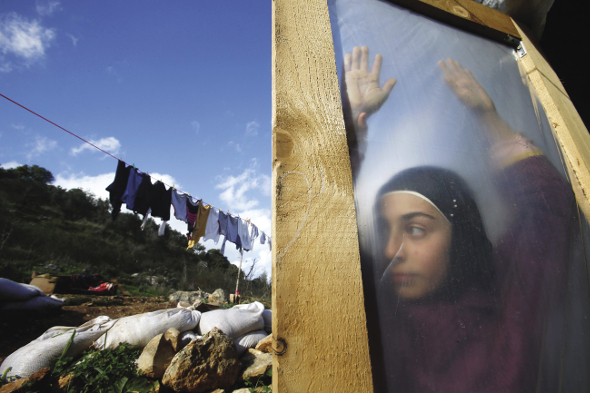 The Palestinian and Syrian refugees looked at each other, thinking, for a few moments. There was nothing more to say. Then all the children came in for afternoon activities. ‘Bless you,’ said Merjeh. NOW READ THE ORIGINAL: http://newint.org/features/2016/01/01/how-can-you-say-no/ (This article has been simplified so the words, text structure and quotes may have been changed). This page was last edited on 29 January 2016, at 15:24.